Canadian residents travelled abroad in record numbers in 2010, taking 28.7 million overnight trips for an increase of 9.4% from the previous year and reaching a new high. For the seventh time in eight years, Canadians' overnight travel outside the country increased. Ontario residents made 12.8 million overnight trips abroad in 2010. Residents of Quebec made 5.4 million overnight trips. Together, they accounted for 63.3% of all overnight trips from Canada to the United States and overseas countries. Canadian residents took almost 20.0 million overnight trips to the United States in 2010, up 11.1% from 2009. Overnight car trips south of the border rose 10.3% to 11.9 million, the most trips since 1993. Overnight plane trips increased 13.3% to 6.9 million, the highest number since 1972, the year record-keeping began. Travel to overseas countries by Canadian residents rose 5.9% in 2010 and reached a high of 8.7 million overnight trips. This marks the eighth consecutive annual increase and 93.0% growth from 4.5 million trips in 2000. On average, Canadians stayed 15.7 nights per trip overseas in 2010 and spent $85 per night. A stronger Canadian dollar makes it more expensive for foreigners to travel to Canada and cheaper for Canadians to travel abroad. The Canadian dollar had an average value of 97.1 U.S. cents in 2010, up 10.9% from 2009 (87.6 U.S. cents) and 44.3% from 1999 (67.3 U.S. cents). Canadian residents made 24.5 million same-day car trips to the United States in 2010, a 17.3% increase from the previous year and the most since 2000. Even so, these trips still total less than half the record 59.1 million trips set in 1991, when the loonie was at 87.3 U.S. cents. Americans, meanwhile, took the fewest same-day car trips to Canada since record-keeping began in 1972, taking 7.4 million in 2010, which was down 5.1% from 2009. Americans' same-day car trips to Canada have fallen every year since peaking at 27.3 million in 1999—double-digit declines occurred in seven of the last nine years. United States residents made over 11.7 million overnight trips to Canada in 2010, up 0.7% from 2009. This was the first annual increase in overnight travel by United States residents in six years. 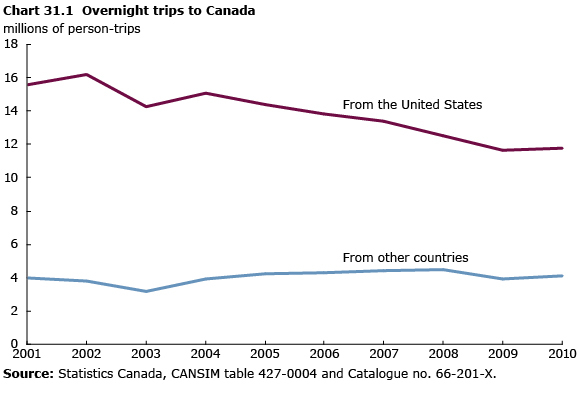 It was, however, down 22.1% from 2004 when U.S. residents made 15.1 million overnight trips to Canada. Overnight plane travel increased 5.7% to 3.5 million trips in 2010, but overnight car travel declined 1.8%, the sixth consecutive annual decrease. Overnight travel by residents of overseas countries increased in 2010 after a decline in 2009. Travellers from overseas countries made 4.3 million overnight trips to Canada, up 6.8% from the previous year. This was the sixth increase in seven years. Overseas travellers spent $5.7 billion on these trips, 4.3% more than in 2009, and stayed 72.5 million nights—an average of 17.6 nights per trip and $78 per night. The most popular overnight destination for U.S. and overseas visitors is Ontario, followed by British Columbia and Quebec. The most visited state by Canadian residents in 2010 was New York State with 3.4 million overnight visits. Florida was second with 3.1 million overnight visits, and Washington State rounded out the top three states with 2.3 million overnight visits. While Canadian residents spent $1.3 billion and stayed 9.7 million nights in New York State, Canadians spent $3.6 billion in Florida, and stayed 53.9 million nights. By comparison, California came second in both spending and trip nights, with Canadians spending $1.3 billion and staying 13.6 million nights in that state. Canadians stayed the longest in Florida (17.4 nights per overnight visit) and spent the most in Nevada ($188 per night). Canadians made almost 1.4 million overnight visits to Mexico, more than to any other overseas country. This was 12.0% higher than the figure recorded in 2009. Canadian residents spent $1.4 billion in Mexico in 2010. Cuba remained in second place with over 1.0 million Canadian visits to the country in 2010. There were, however, 14.0% fewer overnight visits to the Dominican Republic, as the country slipped to fourth place among top Canadian destinations. The United Kingdom was the third most visited country as Canadian residents made 880,000 overnight visits in 2010. Canadians made 4.2 million overnight visits to Europe in 2010, more than any other region except the United States. Second place was Bermuda and the Caribbean, with Canadians taking 2.5 million overnight visits there.